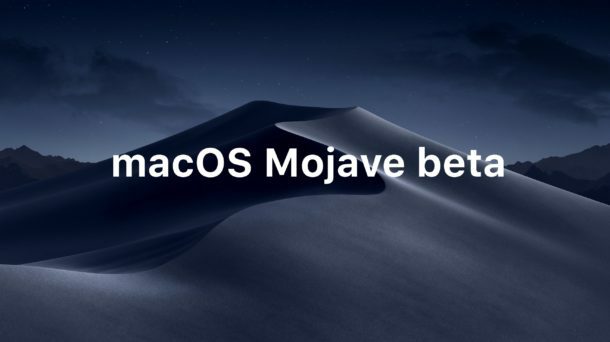 Apple has released the first beta version of macOS Mojave 10.14.1 for testing, just a few days after the final version of macOS Mojave 10.14 became available for the general public. It’s not entirely clear what is being focused on in macOS 10.14.1 beta but presumably the update will aim to fix any obvious bugs and security issues that are discovered with macOS Mojave 10.14. In terms of features, it’s fairly likely that macOS 10.14.1 will include support for Group FaceTime with up to 32 people, much like iOS 12.1 beta 1 which is also in active beta testing. MacOS Mojave 10.14.1 beta 1 is available now for any user enrolled in the developer beta testing program. Typically an accompanying public beta release is issued soon after. MacOS Mojave software updates can be found in the System Preferences “Software Update” control panel, as system software updates are no longer delivered through the Mac App Store in Mojave. Something to keep in mind for beta testers is that if you updated from macOS Mojave beta to the final version as instructed here you will likely automatically get offered the new beta builds unless you opt out of them through the Software Update preference panel in MacOS. Thus if you don’t want to receive the macOS 10.14.1 beta 1 build then you’ll want to opt-out and not install the beta software update. MacOS Mojave has a lot of great new features and capabilities, making it an appealing system software update for many Mac users. Most Mac users are better off running the final stable builds of any operating system however, as beta testing is generally reserved for advanced users and developers. My IT guy told me not to put it on my work machine until it hits 10.14.1 officially. There’s a zero-day exploit in 10.14 that needs to be fixed. The person who found it has notified Apple about it and is going to reveal it to a conference in late Oct or mid-November (can’t remember which).